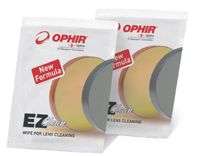 EZ-Clean, an innovative disposable wipe for the routine cleaning of optical laser lenses. Composed of special non-scratch fabric, the wipe deposits a pre-measured amount of quick-drying cleaning fluid that leaves no residue. Single swipe replaces five-step procedure using ethanol, cotton swabs and lens paper, a few seconds; cleaning translates into significantly less down-time for our customers' machinery.